A couple from differing cultures attempt to maintain a relationship. A Date with Miss Fortune is listed as a romantic comedy, but the dramatic moments in the film are more realistic and interesting. Scott and Sousa have great chemistry and work off one another’s energy, but as they’re a real couple, this was always going to be the case. Ryan Scott and Jeannette Sousa are the writers and producers of this independent rom-com, and in real life they are in a romantic relationship. Scott and Sousa also star as the film’s main protagonists, Jack and Maria. A Date with Miss Fortune opens in a classic American style diner, where Jack, who is about to fly off to London for writing inspiration, enters Maria’s life when he randomly sits near her to make his ex-wife jealous. The film then shows the viewers what Maria and Jack’s future life will be like, switching between the future and present. I like the premise of this film and the fact that the conversations Jack and Maria have in the diner draw parallels to their future life together; it’s really interesting to see the differences in behaviour and the white lies people create at the start of meeting a potential mate versus what happens in the relationship. Maria is Portuguese and extremely superstitious, and Jack does all he can to try to impress her family, who want her to marry a Portuguese doctor; this obviously becomes a strain in the couple’s relationship, and the film shows their triumphs and their sad moments. 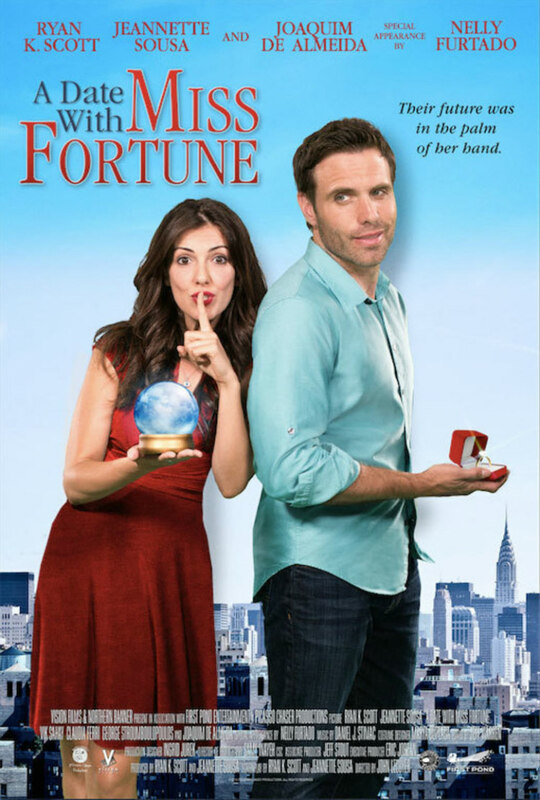 A Date with Miss Fortune is listed as a romantic comedy, but the dramatic moments in the film are more realistic and interesting. The film starts off trying to be too funny at times and this can sometimes lead to a wooden performance from both Scott and Sousa. As the film carries on, however, the relationship gets more and more intense, and consequently the film turns dramatic, which is where the movie shines. Scott and Sousa have great chemistry and work off one another’s energy, but as they’re a real couple this was always going to be the case. The film’s supporting cast play interesting characters, especially Vik Sahay as Wilson, Jack’s career partner and friend, and also Joaquim de Almeida, who is excellent as Maria’s overprotective and old fashioned father. Considering Jack is supposedly a comedic writer, there isn’t really anything that amusing that comes out of his mouth, and so this isn’t believable. I do think though it’s really clever how in the film Jack writes a sit-com about his and Maria’s relationship while here in reality Ryan Scott is also writing about his relationship (in a sense). There’s nothing overly wrong with the film, it’s just quite boring until it gets to the last third; a few more laughs and excitable scenes would have done this film some good.